Jakarta has the best food in terms of taste, variety, and presentations. 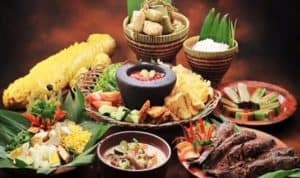 If you only see authentic Bali cuisine in Bali or the traditional Jogjakarta dishes in Java, in Jakarta you will find many culinary from around Indonesia. Your choices for something to feel your hunger is endless. You can go to a fine restaurant or nibble various street vendors all serves the best food in Jakarta. 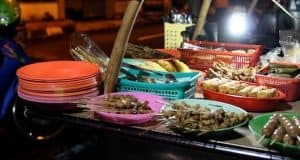 In addition, the busy life in west Jakarta increases various finger food that is quick, tasty and affordable that you can have on your way to your business. The local inhabitant of this capital city of Indonesia is Betawi. Therefore, you can find various Betawi dish around Jakarta, especially West Jakarta. Street vendors with cart serve Soto Betawi (Betawi soup), Kerak Telor (eggs sticky rice), Asinan (sweet-sour vegetable mix) these are a one-pot dish that is tasty and delicious. For those with a sweet tooth, Betawi has a wide variety of snacks such as Dodol, Gemblong, Kue ape, Kue apem, kue lapis ans also some savory snacks with chips like form. Moreover, Betawi cuisine also has complete meals with rice, protein, and vegetable. This dish is famous among restaurant all over Jakarta. Some famous dish includes Uduk rice, which is a rice mix with rich spices accompany with tempeh, tofu, eggs, and many other side dishes that surely make your mouth waters. 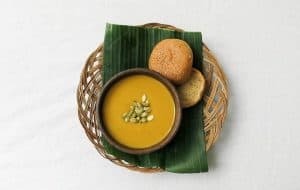 Although Indonesian people never really pay attention to vegetarian food, there is much healthy food in Indonesia due to its rich natural resources. You can find many varieties of food based on beans, or green vegetables. There is much popular vegetarian food in Jakarta, where it is actually a common food but serves vegetarian the most. It is a custom to eat with a vegetable dish in every Indonesian meal. Food such as Gado-Gado, tofu, tempeh, Asinan Betawi is among the traditional vegan food. However, West Jakarta is home from some of the famous vegan food. 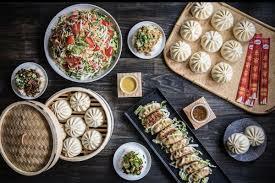 Some of them include Suria vegan cafe, Dharma Kitchen with Chinese and western food, Grassland Vegetarian Restaurant with more of a raw approach. Most of these restaurant serves vegan food complementing Chinese history. Moreover, the most popular modern vegan dish is Burgreens Organic Eatery that serves a raw burger. These healthy choices bring more color to food variety in West Jakarta. More people began to have awareness for healthy and organic meals. Best food in west java is actually you can find it on the street. Street food in Jakarta is simple, easy to prepared and mouthwatering. You can find Chinese, Italian, Indonesia food among the city bliss. However, people are paying more attention to cleanliness and tidy. Some street food vendors get together and make an area suitable for people to eat street food conveniently. Some of the popular Street Food places are OTW Meruya Street Food, that open until late at night and often turn into an affordable hangout place. Street Food Festival create a rich long stall with various food choices. West Jakarta offers various street food places, from Indonesian, finger food, snacks and drinks all combine and compliment each other. Walking down the west Jakarta street and taste their food on the street is a rustic way to enjoy a day in the city. Western Food has a more safe flavor, compared to full of spices food from Asian dishes. This is a great option for foreigners living or visiting Jakarta. You can easily find some western restaurant and cafe in West Jakarta. Kitchenette and Warung Western is an example of a western food with Indonesian approach. The food is quite rich in flavors with appealing presentations. Western food also can mean a formal fine dining. This type of restaurant you can find in Artiz Wine & Dine that serves fine dining in the western side of Jakarta. Another choice is B’Steak Grill & Pancake Greenville which highlight meat dishes to their costumer. 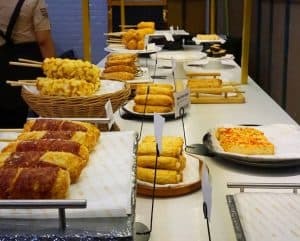 Western food also come is small packages on cafes and snack bar that drawn much interest. For breakfast, sandwiches and burger are the main dishes for a fast and easy way to prepare food in the morning. Fast food restaurant even began serving breakfast menu based on western food. Asian food is another cuisine that is very popular in West Jakarta. You can easily find noodles in the city streets. The most common affordable Chinese food such as Capcay, noodles, Cwimie, and variety of noodles. Japanese sushi and ramen is another popular dish for Jakartan. More and more restaurant opening up that elevate Korean and Thai cuisine. Mapogalmegi Magal BBQ and Samjink Restaurant are highly recommended Korean restaurant. Thai food is mostly sweet drinks and ice creams such as Thai drinks and bubble drinks. There are many Asian cafes with authentic flavor such as Vietnamese coffee that has won over people heart. Finger food is food served in a simple form and style that you can eat it conveniently with your fingers. Some of the Indonesian fries are finger food, both sweet and savory. Another form of finger food is sweets food. There is numerous finger food in west Jakarta, most of them are just a stall on street with no names. Some cafe in west Jakarta serves finger food with their drinks. It is a great choice to accompany tea or coffee. Places such as Halfway and Chic cafe are a moderate cafe with affordable coffee and finger food. 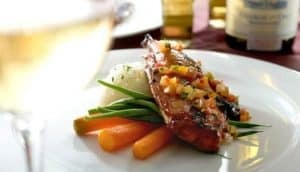 Chillers Cafe & Bar and Wine house in west Jakarta serves western finger food accompanied by alcoholic drinks and wine.